Iyer traditions: Happy Mother's day to all mothers. 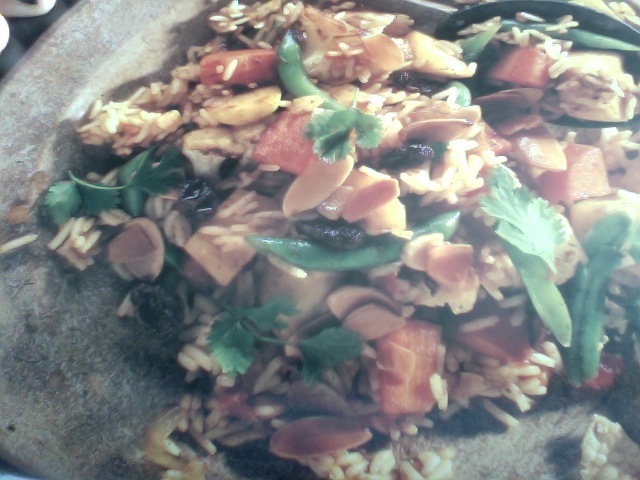 My kids and their dad cooked one easy and quick vegetable biriyani today. I want to share the recipe with u all. This rice dish is an excellent choice if you have to cook for a large number of people at the last minute. Its very simple and easy to make. Use different types of vegetables( or mixed veg. pack)to make it healthier. 1small onion, 1 small carrot ,1/4 small cauliflower, few green beans. water 11/2 cup or veg. broth. 1tsp oil,biriyani paste ,3/4 basmati rice,almonds,raisins,coriander to garnish. To prepare the vegetables ,finely chop the onions cut the rest of the vegetables into chunks. Heat oil in a large saucepan Add onions stir until its lightly brown then add other vegetables cook for 5 minutes.Now time to add the biriyani paste and rice and water .cover and cook 15 minutes until the rice is tender.hmmm..yummy biriyani is ready . When buying the ginger look for the shiny,fine skinned ginger .It should snap easily ,which means it is juicy and fresh.As it gets older it turns dry and fibrous. Ginger is an herb. It can be used fresh, dried and powdered, or as a juice or oil.Ginger is commonly used to treat various types of “stomach problems,” including motion sickness, morning sickness, colic, upset stomach, gas, diarrhea, nausea caused by cancer treatment, as well as loss of appetite. It is well-known that ginger is a potent analgesic and anti-inflammatory agent. The fact that these properties become more pronounced as fresh ginger is dried is hardly common knowledge. Kashmiri cooking makes abundant use of fresh and dried ginger (south/ chukku), an indication that ginger keeps the pain and stiffness out of arthritic joints in the cold months. for tempering -mustard seeds and oil. Grind the ginger ,green chillies and coconut in a blender,make a smooth paste. Mix the yogurt ,salt and tempering. Enjoy the motherhood with your princes and princesses.